This Honey Sweetened Watermelon Limeade is sponsored by Wedderspoon. I’m swapping out sugar for their Manuka honey in all kinds of recipes including this one. All opinions are my own. Enjoy the limeade recipe! There is nothing better than a slice of watermelon on a hot summer day. It’s refreshing, and one of my favorite things about summer. It seems that I buy a watermelon every time I go to the store. Even on vacation, it’s on the grocery list. My kids will grab slice after slice and eat watermelon all day long if I let them. For me, I have to have a little variety. So I’ll often add melon to fruit and green salads, use a slice as a base for a fruit pizza, freeze it for popsicles, and even use it to create this recipe for Watermelon Limeade. You can use it in so many ways! Do you have a favorite? In an effort to cut back on cane sugar, I’ve been substituting Wedderspoon honey for cane sugar in a lot of my baking recipes and beverages. Even when we go out to eat, I’ve been sweetening my tea with these convenient Wedderspoon Honey on the Go Travel Packs. They are super convenient to carry. 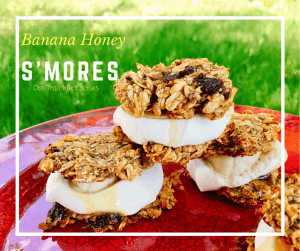 When it comes to baking with honey, I recently made Banana Honey S’mores with Homemade Trail Mix Cookies. 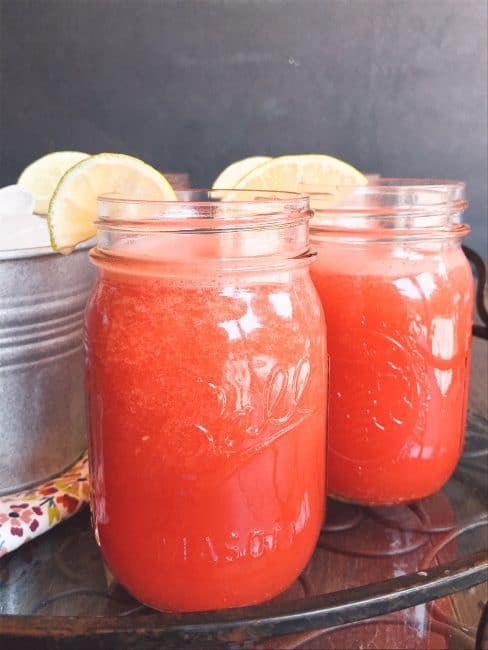 Grab the recipe and see how you can substitute honey for sugar in that recipe and in this one for Honey Sweetened Watermelon Limeade. This Honey Sweetened Watermelon Limeade is refreshing all on its own. But I have a few other suggestions that I think you’ll enjoy too! Watermelon Limeade Slush: Use frozen watermelon cubes to make a slush. Watermelon Limeade Ice Pops: Freeze watermelon limeade in a popsicle/ice mold. Freeze until solid and enjoy. Virgin Watermelon Mojito: Add a few leaves of fresh mint to the limeade and puree in the blender. Garnish with lime wedge or mint sprig. 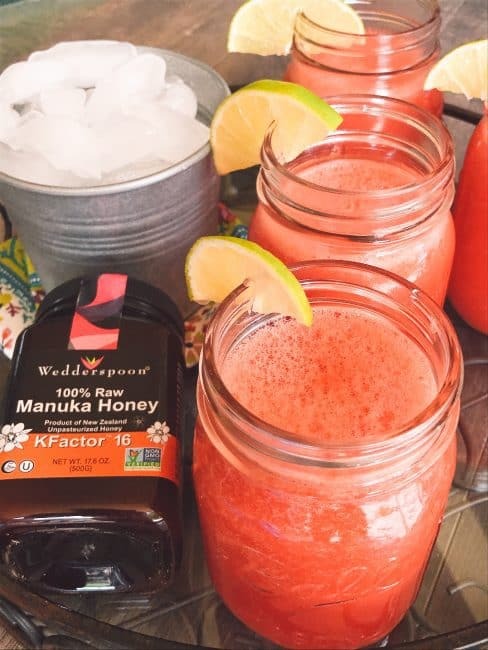 For this recipe, I’m using Wedderspoon’s Manuka Honey with KFactor 16. Wedderspoon has a variety of honey from different sources; Manuka, Rata, Beechwood, and Fir. Each source gives the honey its own unique flavor. 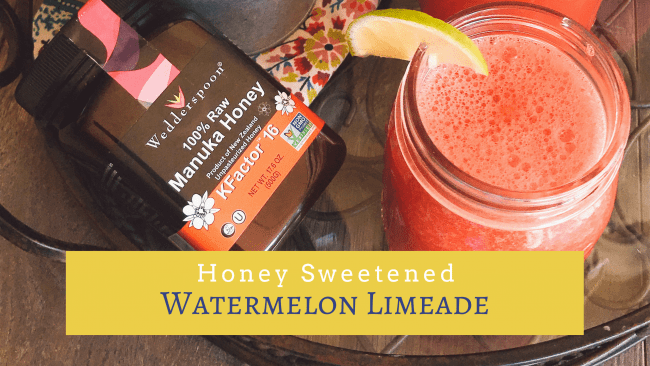 I like Manuka honey best because it has a caramelized sugar flavor and I can use less of it to sweeten recipes like this watermelon limeade. Manuka Honey also has a host of nutritional benefits including allergy relief. I’m not a medical professional but you can read more on Manuka’s nutritional benefits for yourself. 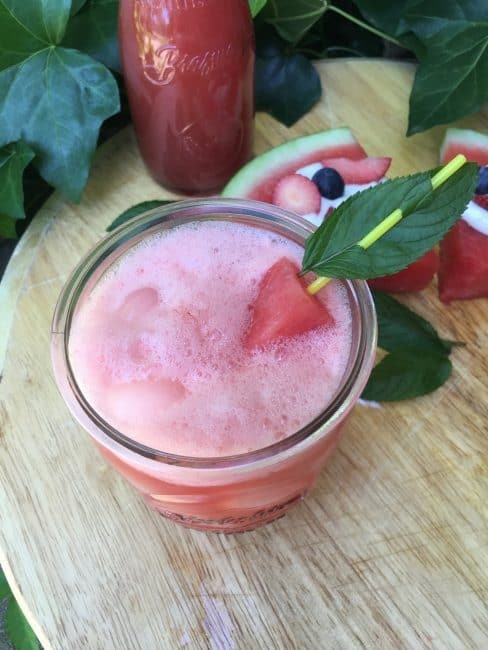 Create a pitcher of this Honey Sweetened Watermelon Limeade for your next backyard BBQ, party, or just because you want to enjoy a glass. It’s the perfect way to cool off in the summer heat. This recipe below will make 6 cups or 1.5 quarts. Watermelon can vary in sweetness. It seems that at the end of summer, melons are super sweet and this limeade will need less honey. I recommend you start with 1/4 cup and add as needed. Play around with the recipe and find your perfect combination! 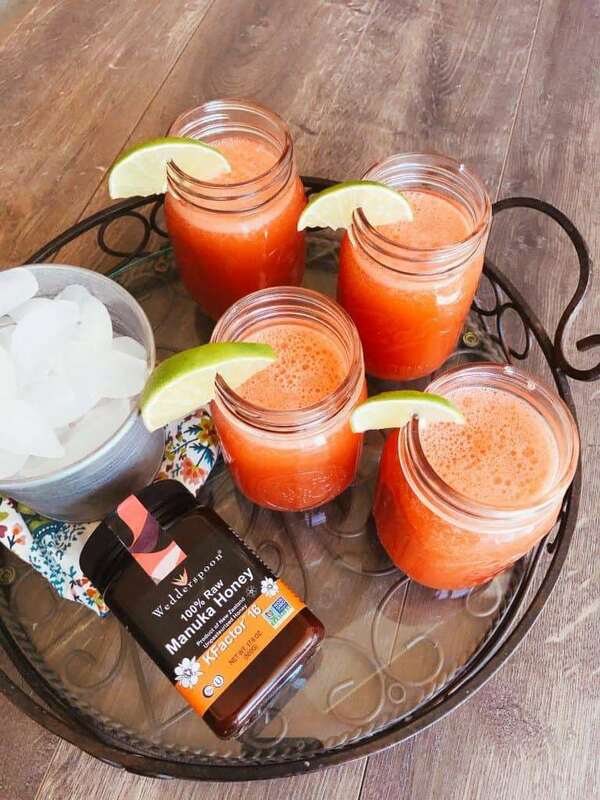 Add lime juice, Wedderspoon Manuka Honey, add watermelon cups to a blender. Pulse until watermelon is pureed and honey is combined. If liquid is under 6 cups, add water as needed. Refrigerate for an hour or serve or ice. ** I should note here that when you puree watermelon in a blender, it gets frothy. I kind of like the frothiness of it. But if you don’t, you can puree at a low speed or refrigerate and wait for the froth to disappear. Wedderspoon is offering Little Family Adventure readers 15% off all website orders. 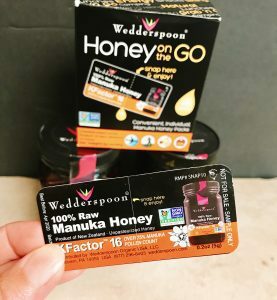 Visit www.wedderspoon.com and use code MANUKALOVE to save today!